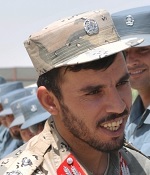 LA Times: In early January, Abdul Raziq, the powerful police chief of Kandahar, issued a direct challenge to Afghan President Ashraf Ghani. Speaking to reporters, Raziq said Ghani’s government “cannot fire me.” It was a typical show of strength by Raziq, a onetime favorite of U.S.-led coalition forces who rose to prominence because of his zeal in fighting Taliban insurgents. A survivor of multiple assassination attempts, he brought relative calm to his volatile southern province while dismissing accusations of torture and other human rights abuses. But Raziq’s statement also highlighted the fault lines that have weakened Ghani’s Western-backed government. Click here to read more (external link). ;but, believe me their are out there invisible. IT WILL ALL, MAKE THE MATTERS WORSE- ironically; still, no body cares to diagnose the real disease. still kicking and alive !